Of course, a facile discussion of GMAT topics might say — the most common GMAT Verbal questions are Reading Comprehension, Sentence Correction, and Critical Reasoning — those three questions are the only questions you see on the Verbal section. Similarly, all of the GMAT Quant questions are Problem Solving and Data Sufficiency. If you are not familiar with this general format, it’s vitally important to learn the variations and strategies for each of these five question types. In fact, it’s important to be familiar with the format of the GMAT and how long the test is overall. Most folks, though, know all this already. Yes, the GMAT Quant section will be split between PS & DS questions, but given that format, what is the GMAT likely to ask? That’s the real question. The same mix of topics show up on both the PS and the DS — those two GMAT math question types do not discriminate in any meaningful way as to mathematical concepts tested. 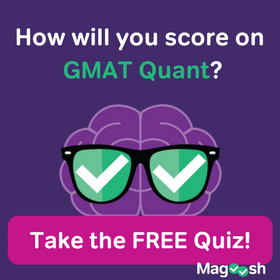 At Magoosh, we did an analysis of the frequency of GMAT Quant concepts in various official materials. Here are a few highlights (but be sure to read the whole Quant concepts frequency article yourself). The big granddaddy of GMAT quant questions is Word Problems. But in a sense, this isn’t a topic. Yes, interpreting Word Problems is a skill. But the classic story problem format is really a medium for many different Quant concepts. The true quant concept that’s most common on the GMAT is Integers and Number Properties, especially Properties of Integers — that one topic (actually, it’s a zoo of interrelated topics!) accounts for roughly 30% of all math questions you see on the GMAT. 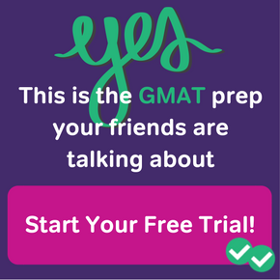 Another extremely frequent GMAT topic is percents (including interest & discounts) — which certainly makes sense for a test designed for folks going into business! Other heavy hitters include (a) algebra, (b) statistics, (c) two equations with two unknowns, (d) rate questions, (e) fractions, (f) exponents & powers, and (g) coordinate geometry. A couple more quick facts: of course, you should know that there is no calculator on the GMAT Quantitative section. This means, regardless of topic, you need to practice your mental math skills, including estimation, divisibility tricks, and the doubling & halving trick. Those are some of the most common skills you will need when answering GMAT Quantitative questions. 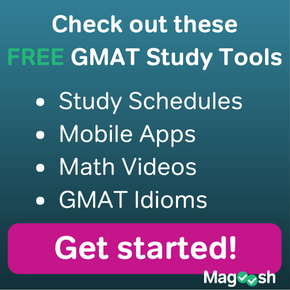 It’s also important to know how to study for GMAT math. Here, the most common GMAT topics vary by question format, so I will discuss the three formats separately. Reading Comprehension: by far, the most common GMAT RC question is the “main idea/ author’s purpose” question. The most important skill is being able to distill the main purpose both the whole passage and of any paragraph in the passage. Another very important RC skill is knowing how to infer from the passage what is not explicitly stated. Critical Reasoning: the three most common GMAT CR questions are the “weaken the argument” question, the “strengthen the argument” question, and the “find the assumption” question. Those three are well over 50% of the CR section right there. One crucial skill on the CR section is simply learning to distinguish the CR question types. Sentence Correction: The two biggest categories for GMAT SC questions are “Logical Predication” and “Rhetorical Construction.” “Logical Predication” has to do with the logical implications of the word order — misplaced modifiers, and the subtle shift in meaning we get between, say, “not almost a hundred” vs. “almost not a hundred“. Not completely different, “Rhetorical Construction” is about language that is direct, clear, and powerful, avoiding anything awkward or ambiguous or too wordy. Together, these two are concerned with how well-crafted a sentence is. Yes, you have to know correct grammar to craft a sentence artfully, but the focus is really at a higher level than the grammar per se. Good grammar is the “clay”, the raw material, from which a cogent sentence is skillfully constructed. Another very common GMAT SC question type concerns parallelism, another “higher level” concept. Virtually any grammatical forms can be put into parallel, but the GMAT of course loves putting long complicated forms in parallel, such as participial phrase, gerunds, and infinitive phases. The GMAT SC also loves comparisons, a special case of parallelism. Finally, another common GMAT SC question type concerns idioms. Yes, Virginia, the GMAT does ask about idioms. Here, we don’t mean “idioms” in the sense of colorful metaphorical expressions (“scarcer than hen’s teeth“, “up the river“, “in a pickle“), but rather, the unique combinations of words that “sound right” — matching the right preposition to a verb, or knowing which verbs require infinitives, or phrasing a comparison the right way, etc. Below is a quick summary of some of the most common questions people ask about the GMAT. Is the GMAT Official Guide enough? How do deal with exam anxiety? What is the pre-exam procedure for the GMAT? We are planning to apply to some business school in January 2016. Roughly, we have 4 month to prepare. We have a question to GMAT experts. Can you please give us some advice what will be better to choose for preparation taking into account our current level and available time. Is it possible to get high score by preparing with “The Official Guide for GMAT Review”? I am afraid that we won’t be able to be in time if we go with “Manhattan Complete GMAT Strategy Guide Set” because we have 4 months for preparation. 4 months – 120 day. To finish Manhattan Guide it will take 15 pages per day. Based on your experience can you tell us what will be better to go with in order to prepare for GMAT. We want high scores because we really hope to get generous scholarship.